The office of Criminal Department Six is quiet, everyone focusing on their own tasks. Suddenly Investigator Go’s phone rings. An anonymous caller informs Go that he sent an incriminating dash cam video to his email address. Go opens the email sent from “I’d like to make a report." Hehangs up the phone and calls for Ha-Ra and Joon-Soo’s attention. Seeing the urgency in Go’s face, Ha-Ra and Joon-Soo leave their desks and gather around Go’s computer to watch the contents of the video. The video clearly identifies two of the four men on the side of the road. Sa Do-Chan lying on the ground with Manager Kim crouched over him, holding a knife to Do-Chan’s throat. Baek Joon-Soon tells them that this must have been sent by Sa Do-Chan. Ha-Ra agrees that this must have all been set up. They now have solid evidence with which to have Kim arrested. Regardless of whether Ha-Ra has the authority to contact the media or not, she remembers that her sister had kept her secret and wants to return the favor. She calls her sister So-Ra and asks her if she wants exclusive information. Soon SBC news reporter Oh So-Ra broadcasts the dash cam video, confirming that Geum Tae-Woong’s employees were responsible for the attempted murder of Sa Do-Chan. Secretary Kim and Jo Sung-Doo are with Geum Tae-Woong in his office watching the news report unfold. All three are completely lost for words; none more so than Manager Kim. As soon as the news finishes, Geum jumps up from his chair, glaring at Kim and angrily demanding to know how he could have handled this so poorly. 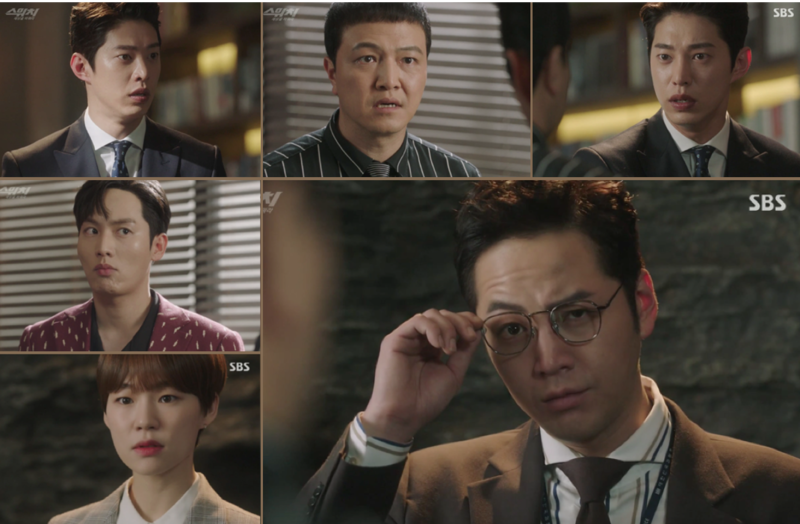 Before Geum can continue reprimanding Kim, Prosecutors Baek Joon-Soo and Oh Ha-Ra, along with their team, barge into the office and walk towards the men. Sung-Do quickly turns off the television while Ha-Ra reads Kim Hyun-Wook his rights. Go handcuff’s a shocked Kim on a charge of aggravated assault. With a desperate pleading look, Kim turns to Geum for help; however, Geum pretends he doesn’t know what is happening and portraying himself as being overwhelmed with shock. Unfazed by Guem's innocent act, Ha-Ra looks at Geum, telling him that he is next. In the background, Sung-Doo struggles to maintain his composure. This is a happy moment for him. As Ha-Ra leaves, Geum, still maintaining his innocent facial expression, turns to see Joon-Soo looking at him. Without saying a word, Joon-Soo lifts up the corner of his glasses and raises his eyebrow in a form of salute, as if to warn Geum ‘you are next’. While Manager Kim is being escorted inside the prosecutors building, Geum Tae-Woong, now alone, reveals just how furious he is. Grabbing various items in his office, he throws them violently around the room, breaking them on impact. He finally picks up a piece of porcelain and throws it down onto his coffee table, smashing it to pieces. As his temper cools enough for him to think clearly, Geum realizes that Do-Chan did not escape. Do-Chan set everything up just to entrap Manager Kim! Quickly wanting to cover his own involvement, Geum calls his secretary and asks to contact General Affairs, saying he wants them to destroy any records about Manager Kim and then to contact security and remove any footage that shows Kim’s involvement with Feel Gallery. Acknowledging that he had been deceived again. Nostrils flaring, Geum screams out of frustration. Meanwhile, ensuring he is alone in the park, Do-Chan calls In-Tae to congratulates him on the perfect timing for when the video was sent. Now that Kim has been arrested, it is only a matter of time before they make the next step. Do-Chan again congratulates In-Tae and tells him “Good job”. He then hangs up, puts his glasses back on, and resumes his masquerade as being Baek Joon-Soo. Ha-Ra and Officer Lim sit opposite Kim in the interrogation room while Joon-Soo observes behind the one-way mirror. Ha-Ra tries to invoke any type of response from Kim, but he refuses to comment. Officer Lim places six photos of the men who have died under the orders of Geum. 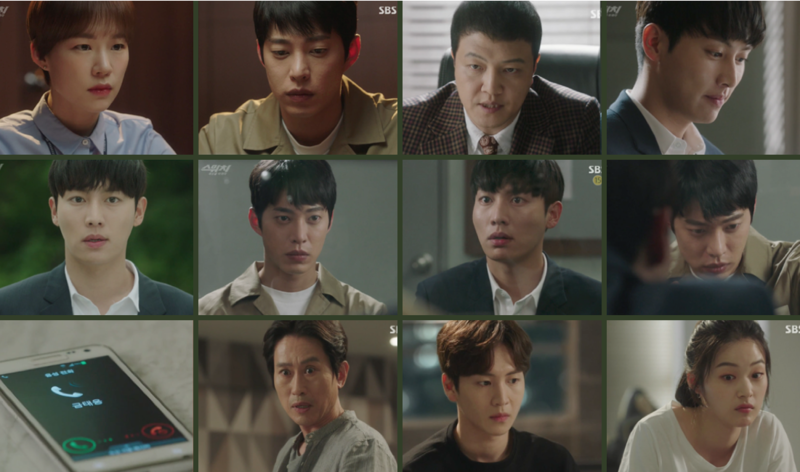 All of their murders point to Manager Kim: the attempted murder of Baek Joon-Soo, the murders of Park Young-Jin, Nam Seung-Tae, the K-Savings bank president and, lastly, the murders of Victor Jang and Sa Ma-Chun. Ha-Ra explains that if Kim did everything himself, he is looking at life in prison with no parole...or even a death sentence. However, if he is able to implicate Geum Tae-Woong as the one who ordered the deaths, he would get twenty years. Further, if he is prepared to cooperate, he would get a lesser sentence. Kim replies to Ha-Ra by saying he wants to exercise his right to remain silent and asks for his attorney. Chief Yang enters and talks to Do-Chan in the viewing room. He wants to know who gave them the video clip to which Do-Chan replies that it was a passing hiker. Yang, still thinking Do-Chan is really JoonSoo, talks to him freely about the case. Do-Chan tells Yang that Kim is not talking, most likely because he is afraid of Tae-Woong. Yang, wanting Geum Tae-Woong brought in for questioning, is surprised when Joon-Soo tells him Geum’s lawyers have advised them that Geum can not come in due to health issues. Yang condescendingly scoffs at Geum, telling Joon-Soo he has never known anyone who has power and money that respect prosecutors. Telling Joon-Soo that they must use this opportunity to arrest Geum Tae-Woong, the first step is to ensure Kim talks. They both agree to not give up as their careers are on the line, with Do-Chan adding that he will put his entire life into this case. Oh Ha-Ra and Baek Joon-Soo stand in front of their case’s storyboard, retracing their steps to find any new evidence. Ha-Ra wants to begin with Ma-Chun’s murder first, to which Joon-Soo replies that Do-Chan will testify for that case. Discussing the whereabouts, well being and safety of Sa Do-Chan, Ha-Ra clearly worries so much about Do-Chan and case that Joon-Soo promises her that he will ensure Do-Chan returns and will testify. Leaving for home at the end of the day, Joon-Soo meets Investigator Go in the hallway. They both stop in front of each other, sensing the awkwardness now that Go knows Joon-Soo is actually Do-Chan. While Do-Chan was in jail, he requested Go visit him so that he could explain Joon-Soo’s suicide mission to trade places. If Do-Chan is to help save Joon-Soo’s life, he needs Go’s help and thankfully Go had agreed. Now, the easiest way to break their awkwardness is through a drink and a meal. While having beer and chips in the park, Do-Chan tells Inspector Go that he can call him Do-Chan. But to avoid any confusion and any unwanted mistakes, Inspector Go says he may look sharp but his brain is simple. From now on, the person in front of him is Prosecutor Joon-Soo. Do-Chan tells Go that even Ha-Ra doesn’t know that he switched identities with Joon-Soo again. They toast their beers to each other and drink. When he arrives home, Do-Chan’s team help him inside, knowing that he is drunk and reeking of beer. Do-Chan belly flops onto the couch while his team remind him that he's working too hard as a half prosecutor - half con-man. Do-Chan replies that he is not worried that Kim is not talking yet, that is up to Ha-Ra. They need to set up and go after Jo Sung-Doo. Singing happily to himself while he walks to his car, Sung-Doo opens the door and climbs in. Continuing to sing, he pauses momentarily to spray some mouth gargle into his mouth and, then, resumes his singing. Checking his rear view mirror, he's suddenly horrified to see two other faces reflected in the mirror. Director Bong slides a black hessian bag over Sung-Doo’s head, and In-Tae and he take Sung-Doo, at least from his hooded perspective, to an ocean cliff side. Standing unsteadily on some rocks, hearing waves crashing, feeling the wind and the occasional spray of water on his face, Sung-Doo fears he is standing on the edge of a cliff and about to be thrown into the ocean. Holding onto Sung-Doo, Director Bong in a deep throated voice tells Sung-Doo this is his punishment for torturing innocent people, for being a scumbag, for taking advantage of others and for killing people. Sung-Doo, desperately fearing for his life, pleads with them to let him live. He apologizes for the things he did in the past and assures them he won’t do it again. Not accepting that answer, Bong lets out a blood curdling ‘No’ and pushes Sung-Doo off the rocks causing Sung-Doo to plummet...onto the floor! Not comprehending where he is, for a moment, Sung-Doo thinks he is dead...until In-Tae removes the bag covering his head. Angry with Sung-Doo, In-Tae tells him that he wants to kill him, but Do-Chan told them to keep him alive. Raising his fist as if to strike Sung-Doo in the face, In-Tae threatens Sung-Doo that if he ever betrays them again.... But he is interrupted by Sung-Doo's final plea. Sung-Doo explains to them that he must do something before he dies: he wants to drag Tae-Woong to hell and make him kneel in front of his mother. Satisfied with Sung-Doo’s response, In-Tae tells him to follow him. 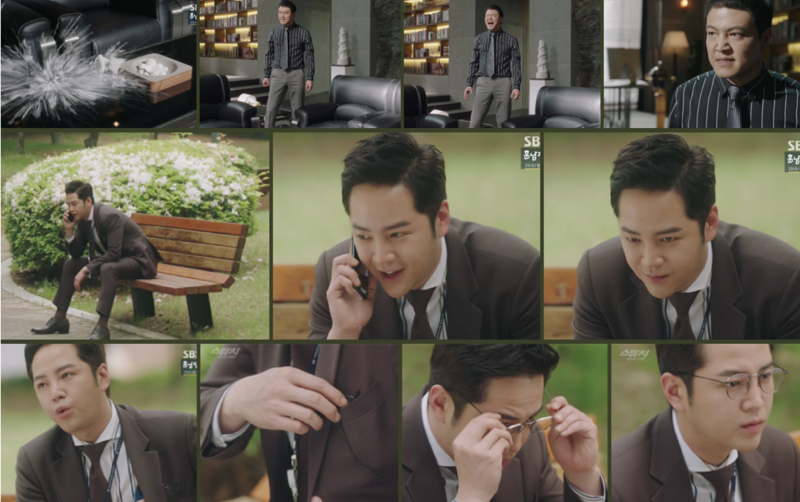 Sung-Doo meets with Do-Chan who asks if he wants to get his revenge on Tae-Woong, even though he is his father? Sung-Doo replies that he wants to make Geum cry bloody tears and also questions Do-Chan about how he discovered their father-son relationship. Ignoring Sung- Doo's question, Do-Chan, with a sly grin on his face, advises Sung-Doo that in order to succeed with revenge, your heart must beat slow and have control. When your heart beats fast, you will make mistakes. Jo Sung-Doo asks him to teach him how to do that. Meanwhile, Geum Tae-Woong meets with District Prosecutor Jin Kyung-Hee at a restaurant. He informs her that Ha-Ra and Joon-Soo are involved with Do-Chan’s escape and insists on having Internal Affairs look into it to find any evidence they can use as proof of Do-Chan's impersonating a prosecutor. Jin wants to know what she would, then, do if it turns out to be true? Geum, however, wants them to focus on the impersonator first. If Ha-Ra has been working with a con man, whatever evidence they find using this illegal method, will not be valid in court, and the prosecutors will not be able to present their findings in court. Moreover, if Internal Affairs discovers that Joon-Soo, Do-Chan and Ha-ra collaborated in switching the two men, they can use it against Ha-Ra and Do-Chan. Thus, Tae-Woong will be free from prosecution. While Do-Chan and Geum are in there own individual meetings, two agents from the Internal Affairs Division of the Prosecutor's Service arrive at the Prosecutors' building. In the interrogation room, Ha-Ra again interviews Kim who is now in prison overalls, asking if he killed Nam Seung-Tae at Bukhan Mountain. When Kim shows no signs of talking, Ha-Ra shows Kim a surveillance photo of his car, proof that he was in the area at the time of the murder. Ha-Ra tells Kim that if he remains silent, he alone will be charged with the murders while Geum goes free. In addition, the murder change carries a life sentence with no parole. Once again, she continues, if he makes a decision not to talk, he may regret it later on as the change cannot be charged. Upon lifting his face to look at her, Ha-Ra advises he choose wisely. Having been summoned to Geum’s office, Jo Sung-Doo is told to go to the detention center and visit Kim. Sung-Doo asks Geum for advice on what he is to tell Kim. Geum is aware that Kim has a hard exterior and does not show his emotions, but Geum worries that he may be worn down from being in prison. He wants Sung-Doo to ensure Kim remains quiet. As a bribe, Geum tells Sung-Doo to pass a message: that he purchased an expensive house for Kim’s mother in Busan. On his way out, Geum tells Sung-Doo that he will now be Kim’s replacement. Sung-Doo bows respectfully and thanks Geum for his trust, assuring Geum that he will ‘repay you for this.’ However as soon as his back is turned, Sung-Doo’s face turns bitter as he leaves the Feel Gallery. Resentful that Geum still refuses to acknowledge that he is his son, Sung-Doo calls Do-Chan. He discloses he will be going to see Kim and asks Do-Chan what he should do. At the correction center, Sung-Doo meets with Kim. He states that Tae-Woong bought an apartment for his mother: Geum will take care of his mother as the price of his silence. Kim, then, unexpectedly asks Sung-Doo what his and Tae-Woong’s relationship is and if Sung-Doo is actually his son. Sung-Doo is shocked, but admits that Kim is correct and asks him how he figured it out. It all makes sense to Kim, how Tae Woong kept giving Sung-Doo more chances after he screwed up. Jo Sung-Doo says that he is that scumbag Geum Tae Woong’s son. Surprised to hear Sung-Doo speak of Geum like that, he is able to sense the hatred Sung-Doo has for his father. Leaning in closer to each other, Sung-Doo whispers to Kim the plan he has in mind. The plan that Do-Chan had instructed him to say. Meanwhile in their apartment, Do-Chan’s team wonder what will happen if their scam for the international lawyer doesn’t work, since Tae-Woong has not called them yet. In-Tae suggests that Geum is being cautious since Kim’s arrest while Bong assures them to be patient. The more Do-Chan meddles with Geum, the more likely Geum will make a mistake. Trying to lift their spirits, Bong tells them that the phone will ring by the time he counts to five. Sure enough, the phone rings! Before answering the phone, Bong reminds In-Tae to get into character. He is now international lawyer Park Hyuk, and Geum wants Park to present his laundering plan tomorrow at Feel Gallery. In-Tae, masquerading as Lawyer Park, meets with Tae-Woong and reveals how they will bring the money safely back into Korea, by using the classic cars. With help from the international law firm, WK Trading Company will export the cars to Liechtenstein. A law firm in Panama will then create ten paper companies and accounts in Liechtenstein to handle the transactions. Each company will then send twenty million dollars to Korea, eventually totaling the entire two hundred million dollars. Once the money enters Korea, the paper companies will be terminated due to no longer being profitable. In-Tae, then emphasizes the most important step of the process. The CEO, Jo Sung-Doo, must then take the money to a casino and gamble it away. Geum Tae-Woong cannot believe what he has just heard! In-Tae explains that this process needs to be done in order to avoid the funds from being traced. He surmises there certainly must be someone in Gangseon who can handle this. In-Tae also tells Geum that because of the large amount of cash, he will need a transport van to move the money. Getting ready for work, Ha Ra puts on her necklace and remembers back when she retrieved it from Joon-Soo. Smiling, she buttons up her shirt, ensuring the necklace is close to her chest. Walking along the street, Ha-Ra tells Joon-Soo that Dae-Ro must think she is an easy target to pick on since he is always like that around her. She and Joon-Soo go inside a Pizza Maru for lunch. Ha-Ra tells Joon-Soo that Dae-Ro caused her lose her appetite, despite eagerly eating her slice of pizza. Joon-Soo grins and points out that it doesn't seem to have affected her lunch. She quickly replies that pizza is different! He then asks Ha-Ra why she just doesn’t return the necklace to its rightful owner. Initially thinking he meant for her to return it to him she begins to protest gently, but Joon-Soo quickly adds that he will buy her another one. In the middle of a mouthful, Ha-Ra stops chewing, shocked. Either Joon-Soo turned extremely cruel or this is not him. Resuming her eating, Ha-Ra tells him that she got it from pretty Mi-Ran. Not understanding why Ha-Ra would take her necklace, Joon-Soo continues eating, oblivious to his mistake. Excusing herself momentarily, Ha-Ra heads outside, containing her surprise and confusion. Resting against a wall, Ha-Ra tries to understand how they had managed to switch again. Still quietly furious over the deceit, she goes back inside and reveals she knows he's Do-Chan and where did he, Sa Do-Chan, hide Joon-Soo! She orders Sa Do-Chan to take her to see Baek Joon-Soo. Not being able to talk his way out of this one, they both go to the park where they can talk more privately. Ha-Ra, clearly revealing to Do-Chan how angry and hurt she is, demands to know what is going on. Do-Chan tells her that Joon-Soo had made him promise not to tell her as she would worry. Do-Chan discloses Joon-Soo’s plan, adding that he was able to go one step further and rescue Joon-Soo. They did this so Do-Chan can continue the investigation just in case he died. Ha-Ra says she wants to see Joon-Soo immediately! Do-Chan takes Ha-Ra to the hospital. Two men guard the security doors, plus for extra security, those, who want to enter the room, are required to scan an ID card, unlocking the door. After scanning his ID card, Ha-Ra enters the room while Do-Chan remains outside leaning back against the wall. Slowly entering the room, Ha-Ra sees Baek Joon-Soo lying on the bed unconscious, attached to an ECG machine and a controlled morphine drip with his face obscured partially by an oxygen mask. The attending doctor approaches Ha-Ra, advising her that because Joon-Soo arrived too late he can not guarantee his survival. However, he assures Ha-Ra they will do their best to save him.